ST. LOUIS PARK, Minn. -- After a scoreless first period, Eden Prairie scored four second-period goals en route to a 5-2 junior varstiy win over Benilde-St. Margaret's. Tyler Sweeney scored twice in the first three minutes, two seconds of the middle period, with the second goal coming 54 seconds after the first. The Eagles would score again to take a 3-0 lead and Sweeney scored a short-handed goal with 1:15 remaining in the period to complete his hat trick and give his team a 4-0 lead. The Red Knights cut into that lead when they got a power-play chance with 6.4 seconds remaining in the period and, after a Will Thompson faceoff win, Jonny Woodford scored from the right-wing boards with 1.7 seconds remaining. The score would remain that way until Jake Hankinson's shot from the left point found its way through traffic and into the Eden Prairie net with 6:03 to play in the game, but the Eagles sealed the win when they scored with 1:07 to play. 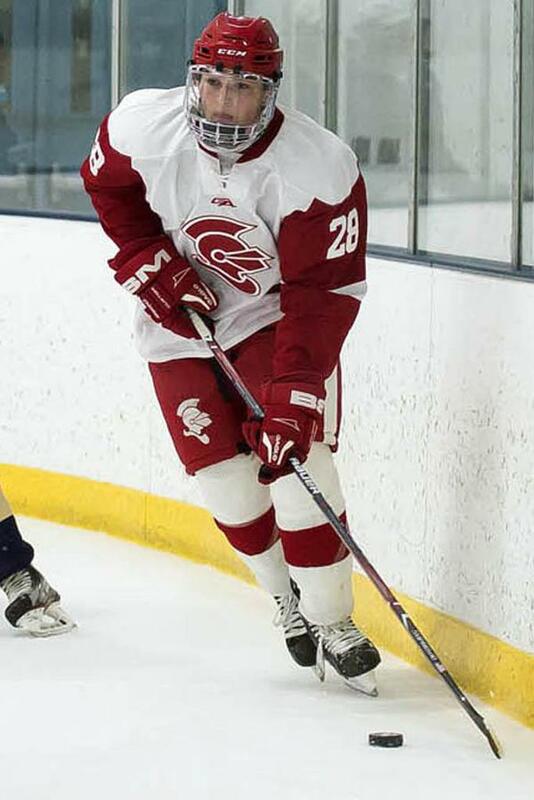 BSM finishes its regular season with two away games this week, including Tuesday's game versus St. Louis Park at the St. Louis Park Rec Center, which gets underway at 5 p.m.
Jonny Woodford scored a power-play goal with 1.7 seconds remaining in the second period.